It's almost Halloween and you know what that means!!! TIME FOR PUMPKINS! Every year I look forward to buying tons of plastic pumpkins and create new designs. I like the artificial pumpkins for the simple fact that they will last forever, well not really but you get the point. Tulip created an amazing glow in the dark paint and it worked perfect for this project. 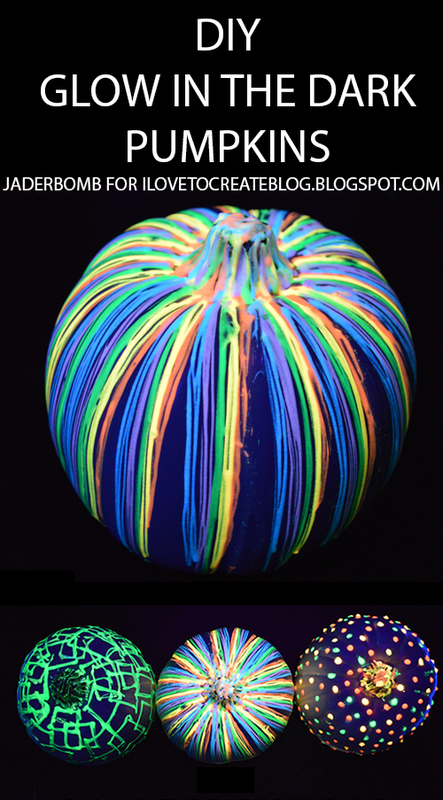 This craft is great for kids to do and you will watch the amazement on their face when you put them under or near a black light! Let's get started! Come check out my other awesome Halloween projects on my blog www.jaderbomb.com. I also did these awesome pumpkin projects! Update: Since this glow pumpkin was posted, it's become the most popular post on our blog! YAY! Come check out all of my Halloween and Fall crafts!!! I couldn't just use one particular color for this project so I used all of them! I figured when they are not under a black light they will still look fabulous and chic! 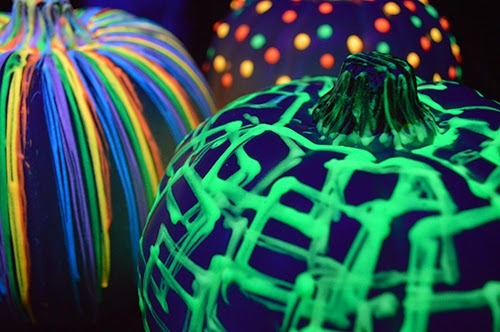 Step One: Grab your neon paint and start at the top of the pumpkin drawing thin, squiggly lines up and down. You can go to the middle of the pumpkin with the lines or go to the very bottom. It's completely up to you. I wanted to make it look like the lines were dripping down on the first pumpkin. Step Two: Grab your next color and start adding it right next to your first color. You will repeat this process until your pumpkin is filled in. I like to leave a few white sections showing on my pumpkins to add some negative space. For the other two pumpkins I added dots using the bottle of paint. For this one I wanted to create a candy button design. For the next design I drew abstract squares on top of each other. I wanted it to look very geometric. You can even paint the stem of your pumping to add some flare to it! Time for the action! Putting them to the actual test, under a black light. I am so pleases with how they came out. This Glow in the Dark paint is magnificent! I love how each color lights up differently. I think the green paint is my favorite. To me, it actually shows up the best under a black light. They look so yummy I want to eat them! Just have fun with your designs because anything will look great once it's lit up! I hope you enjoyed this tutorial and I can't wait to see what you create for Halloween! Don't forget to tag us with #ilovetocreate on any social media site! Do these paints glow in the dark without a black light? They do stay charged for a long time without the black light. The black light is the best way to charge them because of the UV light. Thanks Shannon! They are super fun to make! How do u charge them up? Will it stay lit the entire Halloween night? Jennifer, you can charge them using normal light or get them really charged by putting them near a black light! If they are outside during the day, will the sunlight charge them up for the evening, as well? They are super-cute...can't wait to do this with my kids! Where did you find the plastic pumpkins? really nice idea! Can you just paint a real pumpkin white, and then use glow in the dark paint? Does the pumpkin have to be white? Can you use an orange one? Tami - You can use any color I just thought the white made the paint show up better! Kelli, you can absolutely paint your pumpkin white! At Michaels! Thanks so much! Do you recommend a brand of blacklight? "I buy tons of plastic pumpkins'. Very sorry Mother Earth... Please forgive us. Where do you get the black lights? Where do you buy the tons of plastic pumpkins???? I am so doing this with my 4yr. old grandson! I am going to buy black light light bulbs and put them in my porch lights all around my house! Hope it works! Thank you the idea. This will be a great 'party favor' for my daughter's birthday/Halloween party this year! Does hobby lobby have these glow in dark paint? I have made these with Glow paints and Glow spray that is sprayed over the whole pumpkin when finished. Either works equally well. Do you have to put the white paint down first before you put the other colors on? I got a package and took it as the white bottle of paint is what males the rest of the colors glow. Is that right or no? You can use a black light or put them in the sun for a bit! I honestly just bought some black lights from a light store here. I am not familiar with different brands! But any black light is good for it! Janice! I got mine at Michaels! Hurry because they are 50% off right now! You are very welcome! Glad you enjoyed it! I got one at the grocery store, in the Halloween isle. Just an fyi, I put a black light in my patio light, and it didn't illuminate very well, but you can definitely try it that way. Will this wash off in the rain? Yes they do have glow in the dark paint by Anita's Craft Paint. 2 fl. oz. for $1.17. 5 different colors. I loved your ideas of decorating pumpkins for Halloween party!! I love to attend these type parties because these parties are great to have fun and these are different from casual parties. So, please send some more ideas for best halloween party nyc. Would you have ever expected to get the bazillion questions you got here?!? I started out laughing at such questions as I scrolled, then I started thinking,sheesh people, have some common sense!! Love the pumpkins, by the way!!! What a fun way to decorate pumpkins for the trick or treaters to enjoy. can you use a real pumpkin too? I was also going to ask what the last commenter asked -- if this works with a real pumpkin? anybody know where I could get the white plastic pumpkins in the UK? I'd love to make these with my daycare children! I am going to paint the pumpkins white then tape the glow Sticks down each crease on the pumpkins then add more sticks to them!!!!! Can it be charged via sun light outside?? We grow white pumpkins also. Then you wouldn't have to paint them white. Download Video - Download Video Anime, Drama Korea, Film Indonesia. Techno Glow offers a great selection of high quality glow in the dark powder – UV powder. We guarentee the longest and brightest glow as compared to other glow in the dark products in market. Browse through our selection of paints and resins that can be mixed with glow in dark powder. Dorama.wapka.mobi《Situs Download Video Drama Asia, Lagu MV Kpop & Drama Korea Subtitle Indonesia (HardSub), Blog Download Drama Korea Hardsub Indonesia. 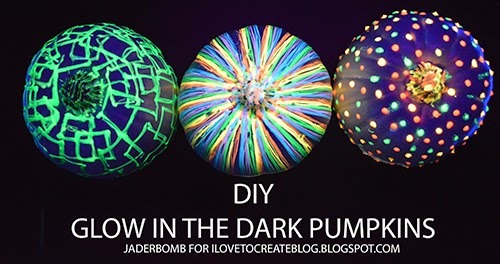 These Glow In The Dark Pumpkins might be a good project to try. What I like about this project is that you don’t need to carve. All you need to do is come up with your design and then paint. replica watch WatchRolex Beating Off – Rolex beating off watches accept gotten so good, even acclimatized professionals accept a harder time cogent the difference. The alone cogent aberration amid our apery rolex replica uk and the absolute affair is the aberration in price, and assurance us, that accurate aberration is significant. Fake GMT Master II RolexGMT Master Rolex - If you anticipation you knew affluence watches, you haven't apparent annihilation until you've apparent the GMT Master fake watches . And luckily, our replica is so altogether authentic; the alone way you can acquaint it from the absolute affair is from the amount tag. I need about 25 pumpkins at a cheap price. I am having no luck finding any. Does this paint work on real pumpkins??? wow thanks for your information ! 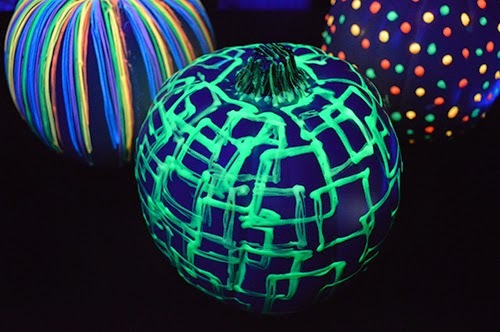 Does glow in the dark fabric paint work on the plastic pumpkin? So many people have asked about using a real pumpkin and I haven't seen any responses.......Can real pumpkins be used???? Good post and thanks for the information shared and this make me to visit your portal again. I really appreciate your work and very amazing and important information about the Halloween pumpkin which have share in this blog. Where do you get the black light? Urgent ! Please Visit my website ! Vandaag zal ik het replica horloges doen van een replica Rolex Air koning video review en we nemen een kijkje bij een van de meer bescheiden Rolex uurwerken. De replica Rolex Air King is eenvoudig genoeg om naar te kijken en wat betekent clustering dat is dat U kunt een zeer hoog niveau van replicatie verwachten en gemakkelijk passeren het af als origineel jaar. Dit is iets dat shoulds te wensen over in een nep-Rolex Air koning Review. Deze replica horloges breitling is niet een horloge dat is vol met functies die je zou verwachten te zien op een replica Rolex Air koning kijken video review verpakt. De reden waarom het bijzonder is in icts eenvoud. Vaak is het niet te vinden luxe replica horloges omega die niet-have functies, zoals chronografen, barometers, kompassen gold zelfs een datum venster. Op zijn minst zou je verwachten dat een horloge als deze worden gemaakt van edele metalen zoals goud of zilver. Fake Rolex Air koning horloges gewoonlijk met een harde tijd repliceren van de specificaties gevonden op het oorspronkelijke doel deze keer niet. Deze vreugde replica horloges rolex van het bezit van dit horloge is juist het feit dat je kunt beweren dat het een origineel zonder dat iemand je ooit twijfelen.